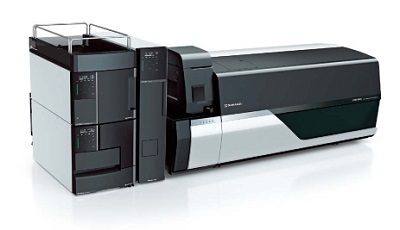 The LCMS-8060 is a ground breaking innovation in mass spectrometry helping to transform LC/MS/MS data quality by developing a new vision for sensitivity and speed. LCMS-8060 is the world’s highest sensitivity triple quadruple mass spectrometer that pushes the limits of detection levels unheard of. The LCMS-8060 scales new heights in scan speeds delivering 30,000u/sec(UFscanning) and a polarity switching speed of 5 msec (UFswitching), again a first time in history. The high speeds seamlessly couple with unrivalled ultrafast Nexera UHPLC performance to detect compounds with far greater confidence and precision. Faster polarity switching time maximizes dwell times and helps to optimize the cycle time of LC/MS/MS methods and the ultra-fast MRM measurements upto 555 ch/sec add to high speed performance. The LCMS-8060 can quickly switch between a full scan analysis and precise quantitation using the Synchronized Survey Scan (SSS) mode which automatically performs product ion scanning once a pre-defined thresholdhas been exceeded. Qual/Quan methods can support a maximum of 1000 events in a single SSS methods. The triple quadrupole LCMS-8060 has an advanced ion guide design to increase ion production and detection. 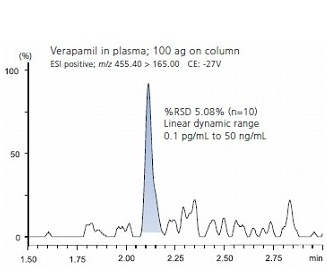 Verapamil spiked into a plasma crash sample can be quantified at 100 ag on column with a precision of 5.08% for multiple injections (n=10) with a linear dynamic range from 0.1 pg/mL to 50 ng/mL. Aldosterone can be detected at a lower concentration of 0.2 pg/mL using neat standards and the calibration curve was linear from 0.2 to 20,000 pg/mL.